10-year-old Miracle Omar, aka Life With The Princess, is collecting socks for the homeless. She's hoping to collect 1,000 pairs by December 1. At K T's Kitchen on Park Heights Avenue, you can buy a world-famous bean pie or a fried fish sandwich and leave behind a pair of socks. "We found out about the box, Sox in a Box," said Alex McCamey, the promotions director for K T's Kitchen. "For K T's Kitchen its another opportunity where people come together that want to give back to the community. 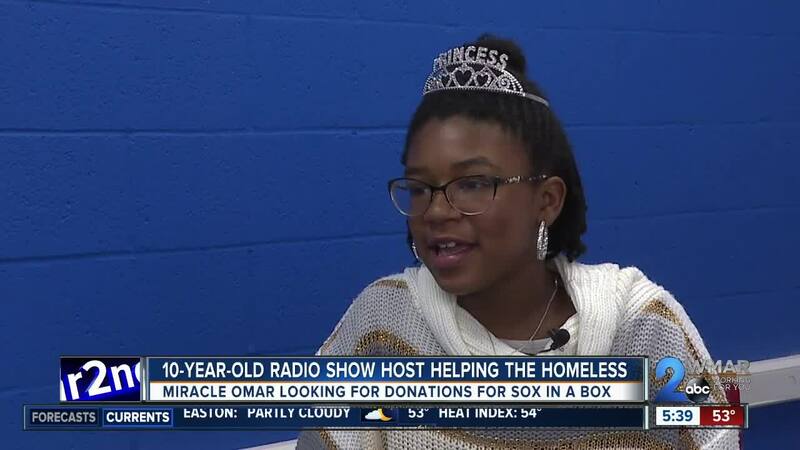 K T's Kitchen is one of several businesses in the Baltimore and D.C. area who are partnering with 10-year-old Miracle Omar, aka Life With The Princess, for her "Sox in a Box" campaign. Omar has accomplished quite a lot in her short time on Earth. She has her own radio show twice a month on WOLB 1010 AM. She also posts videos on her own YouTube channel called "Life With The Princess." Her desire to help others started when she was eight years old. "I wanted to help the homeless and when I was eight years old I collected toiletries to put in bags so I could pass them out," she said. Not long after that, Omar came up with the idea to collect socks for the homeless. She called it Sox in a Box, reaching out to businesses and asking to put a collection box in their store. "At first when I started it, I didn't know how it was going to turn out," she said. In her first year of Sox in the Box, she says she collected 700 pairs of socks. The next year she says she collected about 500. This year, she'd like to collect 1,000. Every time she hands out the socks, Omar says it's the best feeling. "It feels so amazing. I like it when I pass them out and I feel like I did something really good," she said.